Weary of waiting for an economic recovery worth its name, a frustrated American public has sent Barack Obama's job approval rating to a career low - with a majority in the latest ABC News/Washington Post poll favoring a Republican Congress to act as a check on his policies. Registered voters by 53-39 percent in the national survey say they'd rather see the Republicans in control of Congress as a counterbalance to Obama's policies than a Democratic-led Congress to help support him. It was similar in fall 2010, when the Republicans took control of the House of Representatives and gained six Senate seats. Obama's job approval rating, after a slight winter rebound, has lost 5 points among all adults since March, to 41 percent, the lowest of his presidency by a single point. Fifty-two percent disapprove, with "strong" disapproval exceeding strong approval by 17 percentage points. He's lost ground in particular among some of his core support groups. Economic discontent remains the driving element in political views in this survey, produced for ABC by Langer Research Associates. Americans rate the condition of the economy negatively by 71-29 percent - the least bad since November 2007, but still dismal by any measure. Only 28 percent think the economy's improving, down by 9 points since just before Obama won his second term. He gets just 42 percent approval for handling it. Economic views are strongly related to political preferences. Among people who see the economy improving, 65 percent prefer Democratic control of Congress, while among those who see the economy as stagnant or worsening, 62 percent favor Republican control. Notably, economic views are linked with preferences for control of Congress regardless of people's partisan affiliation. The results suggest the corrosive effects of the long downturn on the president's popularity: Among those who say the economy is in bad shape, Obama's overall approval rating has lost 20 points since February 2012, from 46 percent then to 26 percent now. The president faces other challenges. While he's hailed insurance exchange sign-ups as a marker of the Affordable Care Act's success, the program and his rating for handling it have lost ground, both down from their levels late last month after the Healthcare.gov website was stabilized. 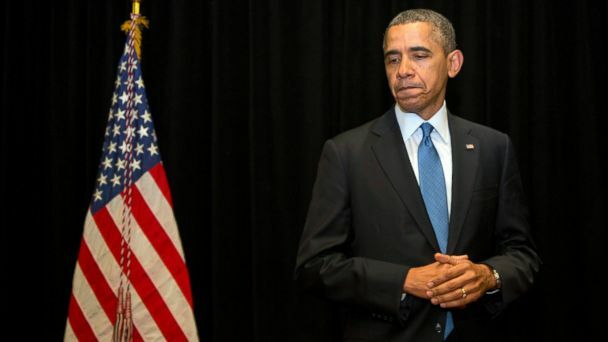 The law gets 44 percent support, down 5 points; Obama has just 37 percent approval for its implementation, down 7. One reason is that the law seems to have opened an avenue for public ire about health care costs to be directed at the administration. Six in 10 blame the ACA for increasing costs nationally, and 47 percent think it's caused their own health care expenses to rise. Regardless of whether or how much those costs would have risen otherwise, Obamacare is taking a heavy dose of the blame. Separately, a current issue on the world stage offers no respite for Obama: Given continued tensions over Ukraine, just 34 percent of Americans approve of how he's handling that situation, 8 points fewer than early last month. Forty-six percent disapprove, with two in 10 withholding judgment. DISCONTENT/MIDTERMS - With these and other problems - but chiefly the economy - the public by more than 2-1, 66-30 percent, says the country's headed seriously off on the wrong track. That's about where it's been lately, and more negative than a year ago. General anti-incumbency results: Just 22 percent of Americans say they're inclined to re-elect their representative in Congress, unchanged from last month as the fewest in ABC/Post polls dating back 25 years. Another outcome is risk for the president's party, in punishment for his handling of the helm. A single point divides Democratic and Republican candidates for the House in preference among registered voters, 45-44 percent. Among those who say they're certain to vote (with Republicans more apt to show up in midterms), that goes to 44-49 percent. Independents, a sometimes swing-voting group, favor Republican House candidates by 55-32 percent (among those who say they're certain to vote). And, as with views on control of Congress, perceptions of the economy correlate with congressional vote preference, regardless of partisanship. ISSUES - None of this means the GOP is home free. A robust improvement in the economy could change the equation. (As many, at least, say it's currently holding steady, 35 percent, as think it's getting worse, 36 percent.) And even as the brunt of economic unhappiness falls on the president, the public divides essentially evenly on which party they trust more to handle the economy - suggesting that the Republicans have yet to present a broadly appealing alternative. In another example, for all of Obamacare's controversies, the Democrats hold a slight 8-point edge in trust to handle health care, again indicating that the Republicans have yet to seize the opportunity to present a compelling solution of their own. Indeed, the Democrats have a 6-point lead in trust to handle "the main problems the nation faces" - although, as with all others, that narrows among likely voters, in this case to 37-40 percent, a numerical (but not significant) GOP edge. The Republicans have a 9-point advantage in trust to handle the federal deficit - an improvement for the party from last month. Similarly, Americans by a 7-point margin trust the Republicans over Obama to find the right mix of spending to cut and federal programs to maintain. The president had an 11-point lead on that question just after the partial government shutdown last fall. The Democrats push back with two results that they're likely to stress as the November election draws closer: One is a broad, 20-point advantage, 52-32 percent, in trust over the Republicans to help the middle class (but again, this narrows among likely voters). The other is an even wider, 30-point lead, 55-25 percent, in trust to handle issues of particular concern to women. The Republicans have some vulnerability in other areas, as well. Americans say the Democratic Party comes closer than the GOP to their positions on climate change, by 18 points; whether or not to raise the minimum wage, by 16 points; gay marriage, by 14 points; and the issue of abortion, by 8 points. On one remaining issue, gun control, the Republicans have a slight, 5-point edge. HEALTH CARE - Obamacare, for its part, is a subject the Republicans have sought to turn to their advantage in the midterm elections, and the poll results show ample opportunity. Costs are a particular target. As noted, 47 percent of Americans feel that their health care costs are rising as a result of the ACA; 58 percent say the same about the overall costs of health care nationally. Just 8 and 11 percent, respectively, say the law has decreased these costs. If there's a case to be made that costs would have risen anyway - or that they would have risen faster absent the ACA - it's yet to resonate with large segments of the population. Other assessments also are critical. The public by a 20-point margin, 44-24 percent, is more apt to say the law has made the overall health care system worse rather than better (although the number who say it's made things better is up by 5 points from December). The rest, 29 percent, see no change. Americans by 29-14 percent likewise say the ACA has made their own care worse rather than better, with more, 53 percent, reporting no impact. Despite the website's improvements, half say the law's implementation is going worse than they expected when it began, vs. 41 percent better - another sign of the persistent antipathy that's dogged Obamacare from the start. The poll also shows both the striking partisan division on Obamacare and the extent to which, on several questions, independents side more with Republicans on the issue. Thirty-eight percent of Democrats, for instance, say the ACA has increased health care costs nationally; that soars to 67 percent of independents and 73 percent of Republicans. And while 47 percent of Democrats think it's made the health care system better, just 6 and 16 percent of Republicans and independents, respectively, agree. OBAMA/GROUPS - Divisions among groups remain especially stark in terms of Obama's ratings; further, as noted, he's lost ground in some of his core support groups. The president's approval rating since early March has lost 14 points among liberals, 12 points among people with postgraduate degrees, 10 points among urban residents, 9 points among Democrats and 7 points among those with incomes less than $50,000. He's lost 9 points among independents as well. With 41 percent approval overall (his previous low was 42 percent last November and the same in October 2011), Obama's at new lows among nonwhites (61-34 percent, approve-disapprove) and liberals (63-31 percent), and matches his lows among moderates (46-48 percent) and independents (33-59 percent). His rating among Democrats, 74-22 percent, is a single point from its low. Other results also mark the extent of the difficulties facing Obama and his party alike. A form of statistical analysis called regression finds that, as noted above, views on the economy correlate both with congressional vote preference, and views on which party should control Congress, independently of partisan affiliation. That suggests that the Democrats are in serious need of a positive shift in economic views. That may be hard to accomplish. While 50 percent of Democrats say the economy's in good shape, that plummets not only among Republicans but independents as well, to 12 and 22 percent, respectively. And while 46 percent of Democrats see improvement in the economy, again just 22 percent of independents, and 15 percent of Republicans, agree. Preferences on which party controls Congress may reflect a general inclination in favor of divided government - and don't always predict outcomes, as in 2002, when more registered voters preferred Democratic control yet the GOP held its ground. It's striking, nonetheless, that this poll finds Republican control favored not only in the 2012 red states, by 56-36 percent, but also by 51-41 percent in the blue states that backed Obama fewer than two years ago. METHODOLOGY - This ABC News/Washington Post poll was conducted by telephone April 24-27, 2014, in English and Spanish, among a random national sample of 1,000 adults, including landline and cell-phone-only respondents. Results have a margin of sampling error of 3.5 points, including design effect. Partisan divisions are 32-21-38 percent, Democrats-Republicans-independents.